While the big GPU-related announcement out of today’s AMD Financial Analyst day was the Radeon Vega Frontier Edition, as part of his presentation, AMD’s CTO Mark Papermaster also offered a brief update of AMD’s GPU architecture roadmap. The admittedly high-level overview doesn’t significantly expand on AMD’s last roadmap from 2016, but it does offer a fresh look at AMD’s timeline, while confirming that yes, as you’d expect, they are indeed working on a post-Navi architecture. The most useful aspect of the new roadmap is that it helps to illustrate which process nodes which architectures will be on. We’ve known for some time now that there are multiple Vega GPUs, but it hasn’t been clear how they’re organized – if it’s a big/little pair like Polaris 10 and 11 – or something else entirely. This latest roadmap strongly hints at the latter, noting that AMD is making both 14nm and “14nm+” chips, the latter presumably being our second Vega. 14nm+ is not an official GlobalFoundries designation at this time, but it is not surprising to see AMD planning for multiple generations of 14nm. As progress on new manufacturing nodes slows and costs continue to rise, all of the major foundries have begun offering multiple generations of leading-edge processes, to allow them to iterate on a process over multiple years and further improve it. Until 7nm is ready, an enhanced 14nm process will help AMD continue to improve their products over the next year or so. Speaking of 7nm, the updated roadmap also confirms that Navi will be produced on a 7nm process. AMD’s partner and former in-house fab group GlobalFoundries has been pushing hard to bring up 7nm, and they are the most likely fab for AMD to use. Besides the use of 7nm, we also know from previous AMD roadmaps that the company is looking into both scalability and next-generation memory for their future architecture. 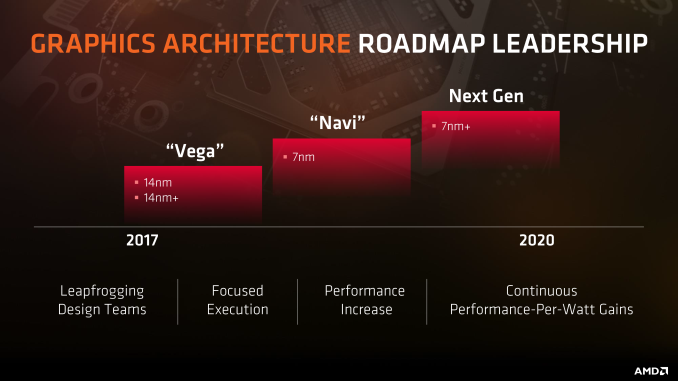 Finally, beyond Navi we have the unnamed “Next Gen” architecture for the last segment of AMD’s 3 year roadmap. This latest update confirms that AMD is indeed working on a 3rd GPU architecture, and that it will be built upon a refined 7nm process. Besides that, AMD isn’t saying anything about what it might feature at this time. Meanwhile, it’s interesting to note that AMD is continuing to produce new GPU architecture roadmaps – even if they are at a high level – while rival NVIDIA has curtailed them entirely. This is an interesting inversion of the status quo; for the longest time it was NVIDIA who laid out long roadmaps while AMD kept their cards close. So for the first time in a long time, we have a better idea of what AMD is planning than their competition.